From Fortune 500 companies to bootstrapped startups, Sorcero can help you build a smarter, more productive workforce. Knowledge, learning and compliance are critical to pharmaceutical and medical device success. Sorcero gives life science companies a competitive edge by helping them provide immediate, verified answers in a highly regulated environment. Tech companies move fast, often leaving their customer-facing teams struggling to keep up. Sorcero helps technology companies bring team members up to speed quickly, master new releases and compete more effectively. Manufacturers are facing unprecedented learning and talent development challenges. Sorcero simplifies workforce training and education by helping employees find better answers, faster, with all the simplicity of asking a question—directly in their workflow. Skilled industrial, construction and service trade workers need reliable answers at the point of work. Sorcero gives skilled workers easy access to training materials and fast answers on their phones or tablets. Finding answers at work can be extremely challenging for everyone. Sorcero helps you find better answers, faster, with all the simplicity of asking a question—directly in your workflow. High-value sales teams need to respond to customer questions immediately and with confidence. 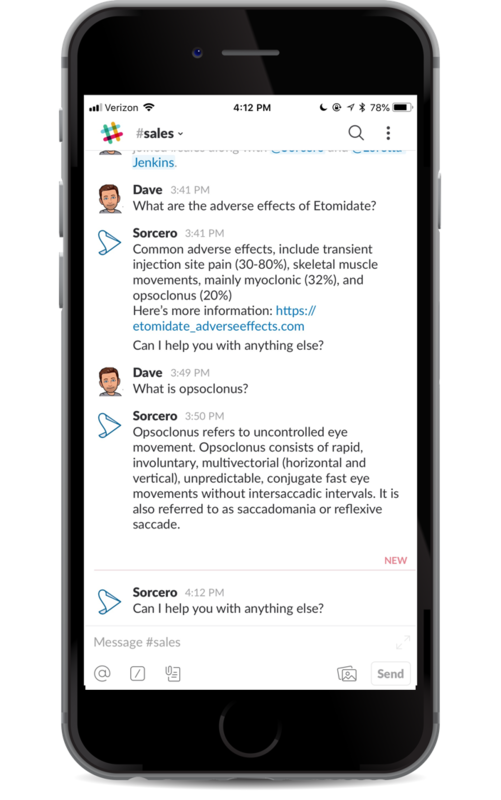 Sorcero provides sales reps with immediate, verified answers, even to complex technical, scientific, and medical questions. Easy access to marketing assets and product information makes everyone happier and more productive. Sorcero helps all your teams find the information they need to provide consistent brand messaging. Forward-looking organizations invest heavily in talent development. Sorcero helps organizations get more from their learning and education budgets by making existing courseware and training documents queryable at work. In the life science sector, wrong answers can have hefty consequences. Sorcero helps control sales messaging and ensure compliance. Further, Sorcero can help document accuracy and demonstrate good faith efforts at compliance.